IO Interactive has confirmed a publishing deal with Warner Bros. for the Hitman franchise, around a year after its future was thrown into question by its departure from former owner Square Enix. Launched back in 2016, the rebooted Hitman was a critical success despite a controversial move to an episodic release format. For IO Interactive, which three years earlier had cancelled all other projects and halved its headcount amid financial issues, the game's release was make-or-break, and despite reasonable sales it proved closer to the latter: Square Enix announced it was looking to sell IO Interactive in May 2017. By June, the company had worked out a deal which saw IO Interactive relaunched as an independent studio following a management buyout. Crucially, the deal included IO Interactive retaining rights to the Hitman franchise - though without the financial backing of Square Enix it was unclear how much good it would do the company at the time. IO Interactive has now confirmed a fresh deal with media giant Warner Bros. that will see the rebooted Hitman relaunched as a Definitive Edition on PlayStation 4 and Xbox One this May. 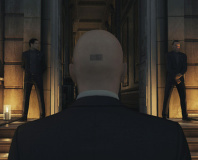 Interestingly, though, while the game includes all the existing game content and more, though not the since-expired timed 'Elusive Targets', Warner Bros. has warned that 'a portion of add-on content is not pre-loaded on the HITMAN: Definitive Edition disc and requires an internet connection' and will require a 12-24GB day-one download. Financial terms of the deal have not been disclosed, nor whether Warner Bros. is supporting development of a follow-up to Hitman Season One.